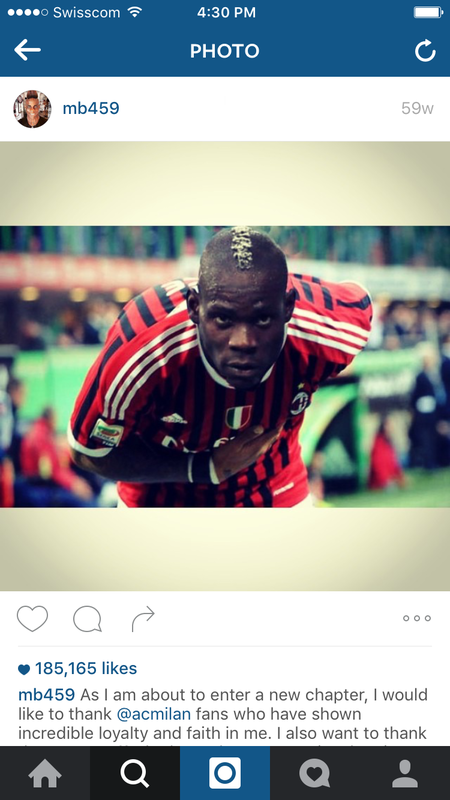 Mario Balotelli thanking the club and the fans in a bowing pose with the AC Milan jersey on and on the pitch. Very well crafted message and visual! Chris Fill and Barbara Jamieson (2006:547) define public relations (PR) as ‘a management activity that attempts to shape the attitudes and opinions held by an organisation’s stakeholders,’ and explain that organisations can use PR to raise visibility, interest and goodwill. Nevertheless, it seems that in general, the discipline of PR is not taken seriously by all professional sports organisations or athletes. With the rise of social media, PR practitioners have (slowly) started understanding and embracing the opportunities, shortcuts, and the great independence that come with Web 2.0 platforms. It seems safe to assume that especially sport celebrities with a highly popular brand would invest the adequate financial and time resources to create a strategic PR plan tailored for social media. However, a look at social media activities of different athletes and clubs makes practitioners wonder, if that is truly the case. In this post, we will adapt the Public Relations Strategic Program Planning Matrix proposed by Laurie J. Wilson (1997, quoted in Heath, 2001:218), developed by the public relations faculty at Brigham Young University, to social media. We will use the brand of Italian striker Mario Balotelli to add exemplary content to the model. The goal of this post is to propose a possible Social Media-meets-PR model that can work for athletes and football clubs. Laurie J. Wilson (ed. Heath, 2001:217-219) explains that ‘a strategic program is one that truly contributes to the accomplishment of organizational goals, and that planning programs to solve specific problems and to accomplish specific goals requires step-by-step accomplishment of the tasks that comprise each step of the four-step public relations process.’ The mentioned four steps include 1) research, 2) planning, 3) communication, and 4) evaluation. step: Research. What is the correct situation? How did we get here? What do we need to know? What problem do we need to address? step: Planning. What do we want to accomplish? If there is a problem, how do we solve it? step: Communication. How do we accomplish our strategies? What tools and techniques can we use? step: Evaluation. How did we do? Did we meet our goals? Let’s dive into it and answer these high-level questions. As mentioned above, we will use the example of Italian striker Mario Balotelli. answer: Mario Balotelli is a young talent with great potential, who because of numerous incidents received bad publicity and, therefore, his brand-value decreased. 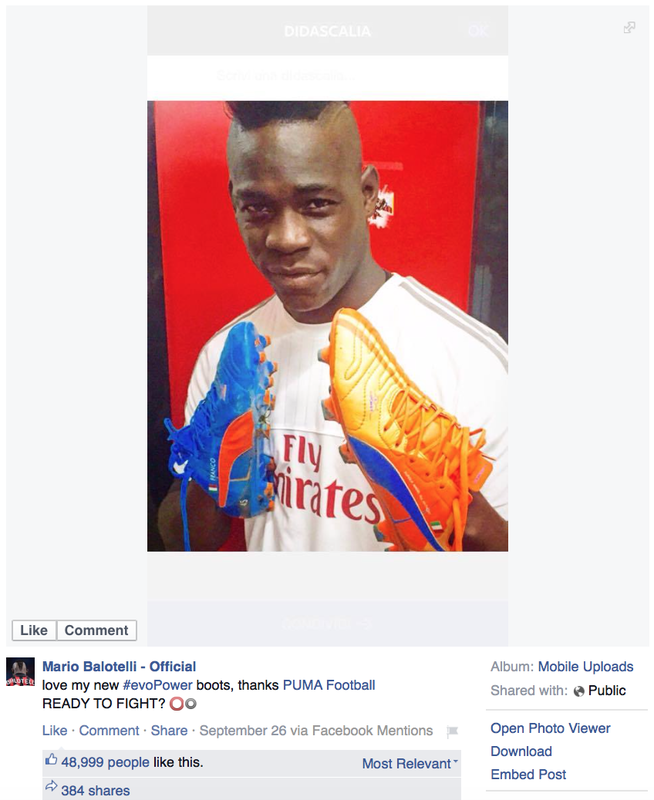 Mario Balotelli actively promotes his Puma boots on his Facebook channel, while wearing a AC Milan jersey that promotes Emirates Airlines. After having gathered an overall idea of what our PR campaign should be about, we can now deep-dive into the Social Media PR Strategic Program Planning Matrix. The goal is to add as much information as needed to the fifteen points across the four steps. Opportunities: Balotelli has received a new chance by AC Milan and enjoys its trust. The club is in transition and Balotelli can be an integral part of that change. If Balotelli can help Milan’s rise to the top of Italian football, he might as well find back to the national team. Threats: If Balotelli does not succeed, the media will claim they were right about him all-along. Rebuilding a strong Mario Balotelli-brand that evokes positive sentiments and works as cushion in case of unsuccessful performances or unflattering incidents. Potential publics that are directly affected by Balotelli’s appearances are himself and the club, AC Milan. In this case, it is necessary to involve or at least inform the club on the social media PR strategy. International sports media: ESPN FC, CNN FC, BBC Sport, Goal.com, Sky Sport, etc. Italian sports media: Gazzetta dello Sport, Corriere dello Sport, Tuttosport, etc. Influencers: Kick TV, Tancredi Palmeri, etc. (Potential) Sponsors: Nike, Adidas, Puma, TIM, Emirates, Mediaset, Audi, Nivea, etc. Twitter and Facebook have proven to be among the most effective social media tools in regard to spreading information and reaching different publics. Nevertheless, YouTube and Instagram are two further platforms that need to be regarded in regard to interactions with publics. Mario Balotelli has a very large following on Facebook with 10.2m likes, Instagram with 3m followers, and Twitter with 3.69m followers (numbers retrieved 13 October 2015). Given the potential reach of these channels, it is wise to use them as PR delivery channels for all key publics. I suggest doing a background check on all key publics to find out through which social media they are most responsive and engage them through that specific channel. Schedule each tactic in a time-task matrix spreadsheet as in the following example. You can download the template here. As stated by Wilson (ed. Heath, 2001:218), “Organized by public and strategy, the budget should project the cost of each tactic in very specific terms; it also should indicate where cost will be offset by donation or sponsorship.” The To-Do List for Social Media PR Planning comprises a cost column that expresses the cost of that tactic as well as a column of the targeted key public(s). Our To-Do List for Social Media PR Planning includes not only the columns addressed above, but also asks PR managers to review and ensure that strategies and tactics are appropriate to send the messages. In addition, the spreadsheet includes space to note what the self-interest of the message is and who the influentials are that can boost the message and add a wider reach. At this point, the PR manager needs to measure and evaluate, if the goal and objective were reached. Reminder: The goal is to increase the perceived Mario Balotelli brand-value in regard to sentiments. This can be done through a qualitative research tactic such as cyber-ethnography, “the study of the communities and cultures created through computer-mediated social interaction. (Wikipedia, retrieved 13 October 2015)”. The objective was to increase positive media coverage of on- and off-the-pitch happenings by (e.g.) 50 percent by the end of season 2015/16. This can be measured by analysing the major social media outlets such as Facebook, Twitter, and Instagram with their respective search engines. Nevertheless, since this asks for a before-after comparison, a collection of media coverage needs to be done at one point (the starting point). Before starting a selection of the to-be-measured media outlets needs to be defined, which will then be measured again at the end of season 2015/16. There are dozens of social media analytics tools out there that can measure close to anything the heart of a manager might desire. However, most of those tools cost good money. Personally, I am a fan of using the analytics tools that come with the channel. Twitter analytics give a very good overview that allow deep-dives and download of the data as a spreadsheet. Facebook analytics give an even better overview of what happens on the page and allows an even better deep-dive for every single post. Instagram does not offer an analytics tool, but the incorporated search engine allows for dedicated search of keywords. This allows for a thorough analysis of sentiments in regard to the Mario Balotelli brand. As mentioned in Point 14: Evaluation criteria, the same media outlets and keywords need to be scanned through the same search engines to ensure reliability of the measurement. Public relations management has always been an important discipline in business, and due to the rise of immediate digital communication possibilities, it is crucial for sports brands and athletes to have a clear plan on how to manage the different messages and key publics. Laurie J. Wilson (1997) gave us a good model to manage and organise PR activities, which we tried to adapt to PR on social media. I have used a similar template for a few years now and it worked well for the company I had it in use.